Boost your Math Proficiency and Growth scores in just one day! Designed specifically to increase the number of students scoring Pass and Proficient on the MAAP Algebra I assessment. Now booking for the Spring 2019 semester! We strive to help all students reach Proficiency—especially students stuck in the lower 25th percentile. Schools and teachers face an uphill battle as they are held to a standard that their students are typically unmotivated to meet. MAAP Algebra I plays a crucial role in measuring a high school's accountability in math. Our Boot Camp format allows you to reach a large number of students in a single event and provides effective test prep, even in the "final hours" before the test. We believe all students can rise to the top. Directly aligned to the MAAP Blueprint, the MAAP Algebra I Boot Camp is a half-day event designed to increase the number of students scoring Pass and Proficient on the MAAP Algebra I assessment. Students will also be introduced to the multiple-choice dynamic item type. MasteryPrep test experts personally train and certify every Boot Camp instructor. Our facilitators are skilled in engaging students and making the test content approachable. Boot Camps balance test-taking strategies and foundational content so that students feel confident in both what's on the test and how to take the test. Through extensive research and careful analysis, our Boot Camp workbooks contain the most frequently tested content in the same proportion as found on the MAAP Algebra I according to test standards. MasteryPrep Boot Camps can be scheduled during the school day or on the weekend. It's never too late for a Boot Camp. We've specially designed our workshop to be implemented in the final weeks leading up to the test. Fill out the quote request and we guarantee to fit you into our availability this semester. Call (855) 922-8773 or fill out the form above to learn more about how we can help prepare your students for the MAAP Algebra I test. Get the support you need at every step of the way. 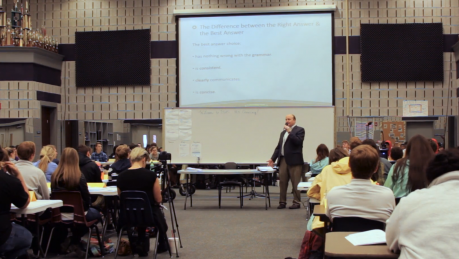 Oliver Pope is one of the nation’s leading experts on standardized test preparation. Having achieved the 99th percentile in no less than five major standardized assessments, Oliver has consistently been at the forefront of innovation in helping students boost their ACT and SAT scores, and he serves as the Chief Academic Officer of MasteryPrep. Oliver has personally trained thousands of teachers and students on how to improve standardized test scores. Craig Gehring earned perfect scores on the ACT® and SAT® 15 years ago, and since that time he has been helping students master standardized tests. As the founder of MasteryPrep and author of over a dozen test prep books, Craig has helped nearly a thousand schools and school districts and over a quarter of a million students improve their ACT and SAT scores. Our MasteryPrep Boot Camp was a great success! Our trainer quickly made a personal connection with the students, which made them particularly attentive to her instruction. The tips and strategies that were taught during the Boot Camp are easy to grasp and implement. It's never too early to start planning for college. Get involved with the best test prep curriculum today!